Biscuits and gravy: amazing or disgusting? Last night on Twitter I was teasing a GT member who shall remain unnamed about the fact that she has never had biscuits and gravy. Then others chimed in, and their opinion of the dish was ... unfavorable for the most part. So what say you, GT, are biscuits and gravy amazing or disgusting? Note: I'm from Missouri, which shares more than a few culinary traditions with the South, where biscuits and gravy seems to be the most common. In Missouri, and especially the rural area where I lived, if a restaurant served breakfast, it probably had biscuits and gravy on the menu. I've since moved to California, where it's not really a thing here, and needless to say, I really miss the dish. 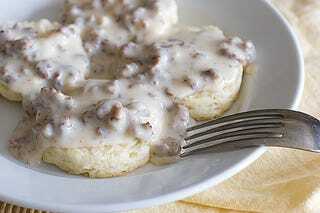 I've joked that if I had the money I would start a food cart or truck that specializes in gourmet biscuits and gravy. But alas, I don't have the money. Damn, now I'm really hungry.